Chinese stocks continued the downward trend on Thursday, tumbling more than four percent to close below 5,000 points, amid a global sell-off. The benchmark Shanghai Composite Index fell 4.41 percent to end at 4,984.16 points, the lowest level in nearly three months. The latest closing marked a loss of 18.62 percent from the all-time high of 6,124.04 set on October 16. Other key indicators also dropped. 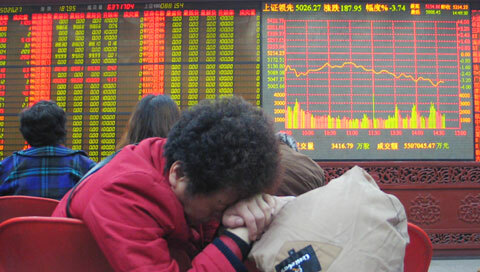 The Shenzhen Composite Index lost 4.61 percent to 1,253.28, while the CSI 300 declined 4.49 percent to 4,773.16. The fall came amidst a meltdown in the global market on the previous day. In the United States, the Standard & Poor's 500 index and the Dow Jones industrial average each fell by more than 1.5 percent. Japan's Nikkei stock average closed down 2.46 percent, while Hong Kong's Hang Seng index fell 4.15 percent. Turnover in the Shanghai and Shenzhen bourses shrank to less than 100 billion yuan, indicating weak investor confidence after a month of corrections. Worries over further monetary tightening weighed on the market. Premier Wen Jiabao vowed on Tuesday to prevent the economy from overheating and keep inflation in check. The Consumer Price Index rose 6.5 percent in October from a year earlier, the highest level in more than a decade. In the first three quarters, the world’s fourth largest economy grew 11.5 percent year-on-year on rapid expansion in credit and investment. Central bank governor Zhou Xiaochuan has said there will be no interest rate hike this week. However, the lingering concerns kept investors away from the market, analysts said. A series of IPOs this week impacted the liquidity in the market. Trillions of yuan of capital may have been frozen in subscription for the initial public offering shares of China Railway Engineering Corporation. Another factor that may have dragged down the market is central bank vice-governor Wu Xiaoling's statement that regulators will definitely implement the scheme allowing mainlanders to directly invest in Hong Kong shares. Wu made the remarks Wednesday during talks with Hong Kong chief executive Donald Tsang in Beijing. However, the banker said several arrangements must be made before the official launch. The so-called "through train" plan was announced by the State Administration of Foreign Exchange (SAFE) in August, sparking a spectacular run in the benchmark Hang Seng Index in Hong Kong, although no timetable has been set. Earlier this month, Premier Wen said the mainland is not fully prepared yet, putting the plan on hold. Yu Yongding, a former member of the central bank's monetary policy committee, supports the suspension in an article published on Tuesday in the Chinese language website of the Britain-based Financial Times. That plan might lead to an exodus of capital, which could result in a big impact on the economy, Yu was quoted as saying.